A lot of exciting things is happening at BetVictor Casino for example with the launch of the two brand new slots, Star Trek Against All Odds and Where’s the Gold! A lot of exciting things is happening at BetVictor Casino! 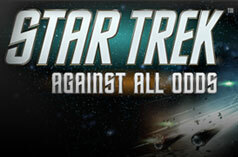 For example they have just released the all new Star Trek Against All Odds. Play longer and prosper with high hit frequency and arcade-style battles on this Galactic new slot. Including 720 Ways to Win with bi-directional pays, an Energising Wilds Feature that turn multiple symbols wild, early and often, and a futuristic and hugely entertaining arcade-style bonus feature; Defend the Enterprise and reap some huge rewards! To celebrate the launch of the new slot, you can participate in a prize draw where you can win one of 52 out-of-this-world prizes including an all expenses paid trip to Orlando, USA! Visto find out more. You can also take a journey deep into the mines this week as you search for the ultimate treasure in another fascinating new slot, Where’s the Gold. Get 3 or more Dynamite Scatter Symbols and trigger the superb bonus feature, where you get to select one of 5 colorful characters to mine for Free Games and extra Free Game Wild symbols. With up to 10 Free Games and up to 3 Wild Gold Symbols to be found, choosing the right miner could land you a fortune! Play on the brand new slot this week and BetVictor will reward you with 25 free spins!